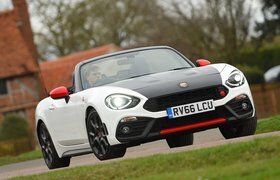 New Abarth 124 Spider vs Audi TT Roadster | What Car? You don’t have to look hard to notice plenty of Mazda MX-5 inside the 124. 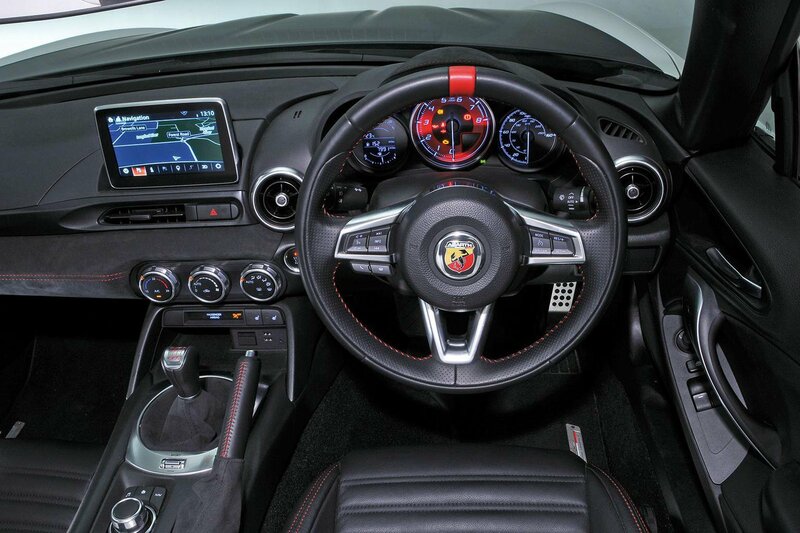 In fact, aside from some Abarth branding and a bit more soft-touch plastic, there’s very little to separate the two cars’ interiors. That’s a problem when you consider how much money Abarth is charging. Not only are some of the plastics below par, but the absence of reach adjustment for the steering wheel and height adjustment for the driver’s seat also make it tricky for taller drivers to get comfortable. Switch to the TT and it feels like you’ve got out of a broom cupboard and into a grand hall. The interior is much wider and the seats drop much lower, so you feel like you’re in the car, rather than on top of it. There’s a lot more head room with the roof up, too, although the 124’s seats do slide back farther. As for interior quality, the TT is simply in a different league. In the 124, you get a 7.0in touchscreen that can also be operated via a rotary dial controller. It’s easy to navigate, looks smart and comes with sat-nav as standard. The TT does things differently, with a larger 12.3in screen sitting in place of conventional instruments. The screen resolution is much sharper and the menus are even easier to navigate via Audi’s MMI rotary dial controller. Sat-nav will cost you an extra £1490, though – part of a Technology Pack that includes Audi Connect internet-based services. If you’re hoping for a big boot in either car, forget it. The TT’s is more capacious, but it isn’t very tall and getting to the farthest reaches of it can be tricky. It is a fairly uniform shape, though, unlike that of the 124. While smaller in capacity, the 124’s boot is at least taller and easier to access.